Technology: Electrical Discharge Machining, or EDM, Services are metal removal services which use the energy of high temperature sparks to melt away metal from workpieces in very small steps. It is popular for very accurate machining of hard metals. Its common forms are ram, or die sinker, EDM and wire EDM. Another form is used to drill blind holes and is often called hole popping. Wire EDM is often likened to cutting with a bandsaw where the EDM wire must cut completely through the work. In sinker EDM, the electrode is shaped to produce the desired form and does not have to cut fully through the work. Hole popping similarly uses a tube to bore small diameter holes. 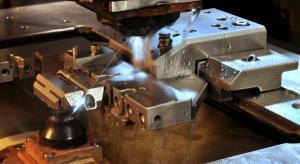 EDM is used to machine complex forms that might be difficult or impossible with conventional machining. Advantages: Electrical discharge machining services have many applications for machining very fine features in very hard materials. Applications: Electrical discharge machining services excel at cutting very hard materials that would challenge conventional machining methods.